Husband-and-wife speaking team, both Ph.Ds, have educated and delighted audiences for over 30 years. We present up-to-date research with humor and liveliness. Great keynote speakers with solid content and lots of interaction. Drs. 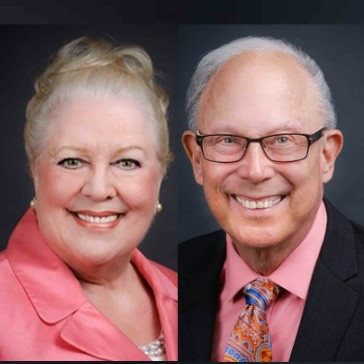 Jan and Neal Larsen Palmer are specialists in nonverbal communication who show leaders in business, higher education, and health care how to build their personal credibility through skillful use of body language. They also work with attorneys to prepare clients and expert witnesses for testimony, especially when appearance, demeanor, and credibility are critical to the case. Jan and Neal speak as a team, educating audiences with lively and humorous examples. Often called "the dynamic duo," the Palmers build enthusiasm for the importance of body language through PowerPoint and live demonstrations. Audiences learn while laughing. They even try out what to do--and not to do--for their own professional credibility. Dr. Janet Larsen Palmer holds a B.S., M.A., and Ph.D. from the School of Communication at Northwestern University. Dr. Neal Larsen Palmer has a B.S. from Georgetown University, an M.A. from UC Berkeley, and a Ph.D. in Linguistics from the University of Michigan. Together, Jan and Neal founded Communication Excellence Institute, a Los Angeles area communication consulting firm, in 1986. Now in its 33rd year, CEI has grown to be one of the Top 50 Woman-Owned Businesses in California’s Inland Empire. Find out more about Drs. Jan & Neal Larsen Palmer at http://www.talk2cei.com.